The Korean Tourism Organization (KTO) has launched a new app for tablet that contains Korea tourism promotional publications. 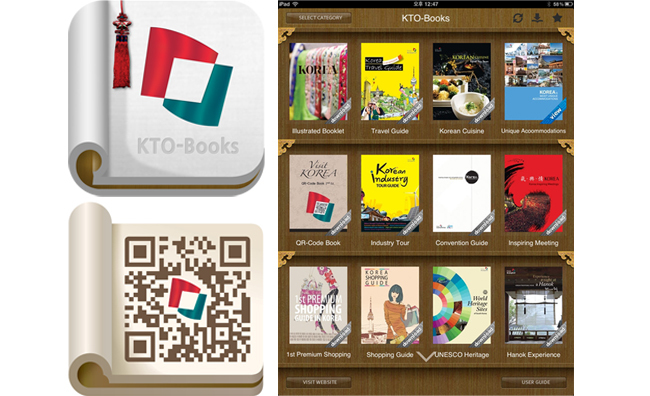 Titled KTO-Books, the app currently contains 22 e-books published by the KTO including Korea Tourist Map, Korea Travel Guide, Photo Gallery, Korean cuisine, Korea's Most Unique Accommodations and UNESCO World Heritages of Korea. It also allows users to bookmark, zoom-in and preview the available content. Launched in October 2012, the free app is expected to make information gathering and navigation easier for future visitors to Korea using tablets. It is available for free download from the App Store as well as the Google Play Store. You can also call the 1330 Korea Travel hotline at +82-2-1330,which is available in 4 languages; Korean, English, Japanese, and Chinese. For more information, visit www.visitkorea.or.kr. Article brought to you by Korean Tourism Organization.